Home ♦ Coffee ♦ What is cold brewed coffee? Cold brewed is a coffee term that has been popping up more and more frequently, even though there are plenty of cafes – including the chain Seattle’s Best – that have been offering up cold brewed coffee for quite some time now. 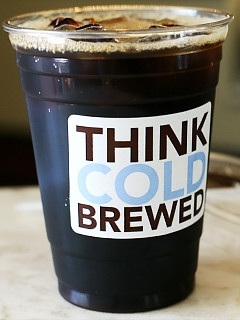 Cold brewed coffee is just what it sounds like: coffee that is brewed cold, not hot. To make it, ground coffee beans are placed in cool water and left to sit in a cool place for around 12 hours to brew. Cold brewing produces a milder and sweeter cup of coffee than simply refrigerating coffee that is brewed hot. You don’t get the harsher, more bitter notes of coffee that are often brought out after chilling hot-brewed coffee. Cold brewed coffee will keep very well for several days in the refrigerator after it has been made, and it is easy to make a big batch and keep it on hand. As with regular coffee, you will want to experiment with the ratio of coffee grounds to water to get a concentration that you like, but err on the side of using too much coffee. Not only are you not rising adding bitterness to your drink by doing this, but you can always water down a cold-brewed coffee concentrate with a bit of extra water before serving if it is too strong.